All About Beer: Tell us about your brewery. Paul Holle: Sawtooth Brewery is a small brewery start-up in the mountain resort town of Ketchum, Idaho, next to Sun Valley Resort. 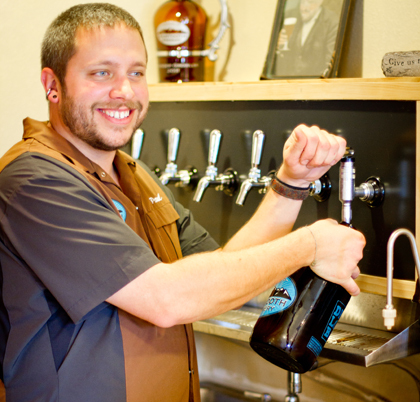 We have been open just over nine months and expanded from 30 BBLs a year to 460 BBLs a year! We focus on American style beers with seasonals and one-offs of all styles. We now also contract brew in Pocatello, Idaho, producing 6 BBLs a week there. How did you first get into brewing? I first started as a homebrewer in 2006 when I was 23. My first professional brewing was in 2011 when Sawtooth Brewery opened. I brewed the St. Paul Porter extract kit from Northern Brewer at my apartment in St. Paul. I’m a huge fan of seasonals, especially Oktoberfest! Mostly the other head brewers throughout Idaho! I am mostly inspired by seeing happy people drinking my beer, knowing that I created something that gives them pleasure and relaxation. It helps being the only brewery in Ketchum and knowing everyone in town! I also have a high standard for myself and my beer and won’t settle for something until I know it is where I want it to be in all aspects of the beer. We also have done some very smart business moves to keep our overhead down and allow for starting up with limited cash. The same as the slow-food and local food movements. They want to support someone local, not something far away. Patrons are looking for variety in their beer and a story behind it. I think we will start to see a third separation from the big beer producers to the regional producers to the smaller, local breweries. The small guys will take on the large regional breweries opening multiple huge production facilities to push for even more focus on what is truly local and unique. I think it comes through educating our customers. That the huge regional breweries are making great beer, but they are not microbreweries but macrobreweries producing on a huge scale compared to so many of the other breweries out there in the craft beer world.